Cyanobacterial Genetics. University of Alicante. 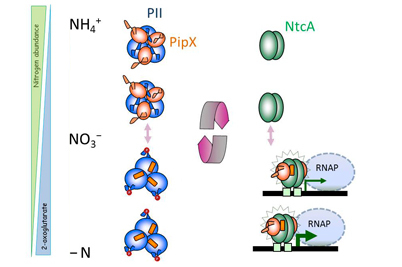 A complex network of protein interactions allows cyanobacteria to control nitrogen metabolism in response to the intracellular nitrogen to carbon balance. 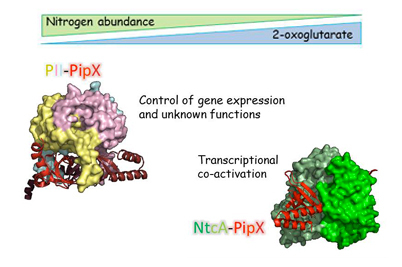 PipX, a protein identified by us, is a multifunctional protein that forms complexes with the two nitrogen regulators PII and NtcA according to the 2-oxoglutarate levels. We are studying the molecular details and consequences of the complex protein interaction network in which these protein work.